Tea Hills is a family run farm with an on site farm market offering fresh seasonal meats, vegetables, eggs, and dairy products. All of the animals on our farm enjoy the sunshine while grazing, drinking fresh spring water, and breathing clean air. Allowing our animals to mature slowly and forage without feeding any growth stimulants, or chemicals, results in meat product that is flavorful, and nutritious! 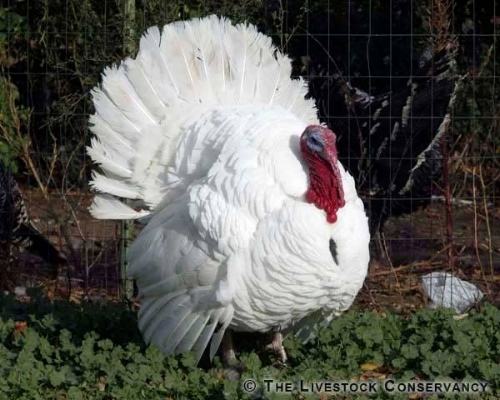 This Turkey (known as the American Broad-Breasted White) is the most popular in the US. Through careful selection, this bird appeals to a wide variety of consumers because of its large amount of white meat, large breasts and white feathers (providing an unscathed skin). Known for its tender and juicy meat, this turkey is available in a wide range of sizes. This turkey was the most popular turkey variety in the US prior to the 1960's. It is stately in appearance and stands four feet tall, with an 18 inch tail and 6 foot wing span. The color is copper bronze with a background of brown and black, and white bars on the tail. Today, this breed is promoted for small scale production. Named for Bourbon County, KY, this variety resulted from breeding for improved meat production and a darker red color. The American Poultry association recognized this variety in 1909, and it was ambitiously promoted with an emphasis on its heavy breast and richly flavored meat. Handsome in appearance, they have brownish to dark red plumage with white in the flight and tail feathers. These are listed in the US Ark of Taste as a food that is in danger of extinction. By promoting and eating Ark products, Slow Food USA helps ensure they remain in production. These turkeys are from this year and have never been frozen. antibiotics. (Brining for 24 hours is recommended for all natural turkeys). than half of their lives. These turkeys are raised outside on 15 acres of lush pastures and in wooded areas that stimulate their natural environment. The ability to explore the hills, valleys and trees contribute to a richer flavor with more muscle tone. The carotene from the grass they eat also provides both rich flavor and color. They have access to fresh spring water (free of antibiotics and additives) at all times. These turkeys are fed a diet of non‐GMO feed for the first two thirds of their lives and are finished on certified organic pastures and organic corn. The turkeys are processed in a facility that uses organic practices. Tea Hills Organic Farms plans on receiving full organic certification for their turkeys in the near future. For more information, visit www.TeaHillsFarms.com . for more information on Ark of Taste, please visit their website : https://www.slowfoodusa.org/ark-of-taste-in-the-usa.